Vortex generators became an optional retrofit in November 1968 to reduce “vertical bounce” during cruise flight which was caused by airflow turbulence and separation from the body beneath the horizontal stabilizer. The 1968 modification was to install the three lower aft body vortex generators and another on the underside of the horizontal stabiliser near the body. 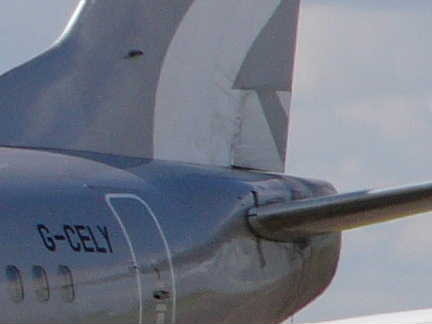 The stabiliser vortex generator was removed in 1971 due to higher than expected in-flight loads and the four upper aft body vortex generators were added instead. These modifications were all optional because not all aircraft exhibited the vertical bounce. 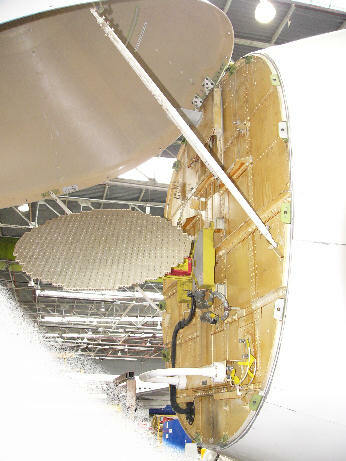 The full set of vortex generators were installed at production from 1971. Classics were initially produced without any aft body vortex generators (see photo). However the upper vortex generators were reinstated after line number 2277 (May 1992 onwards). This was to reduce elevator and elevator tab vibration during flight to increase their hinge bearing service life. They have been designed out of the MAX. 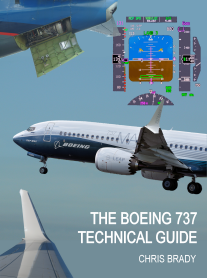 The 737 MAX has an aerodynamically redesigned circular tailcone so does not require any vortex generators. 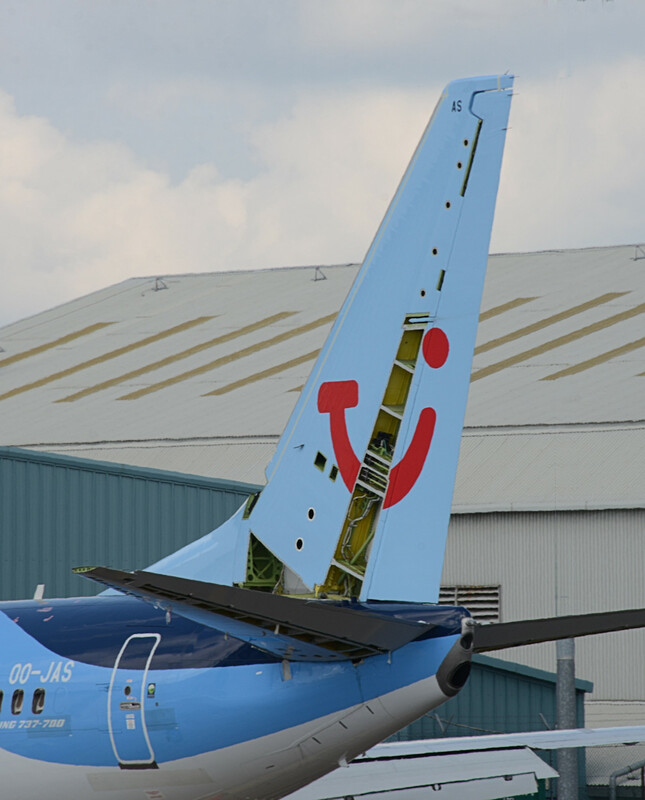 This photo shows a 737NG fin under maintenance. 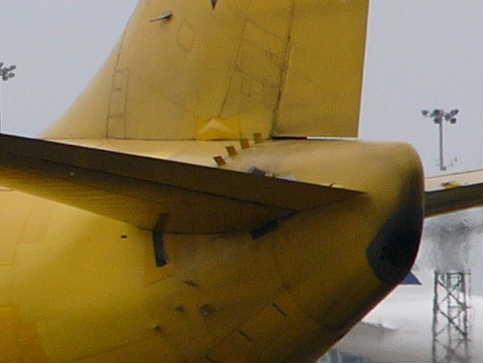 The main component visible (near the red decals) is the rudder PCU. 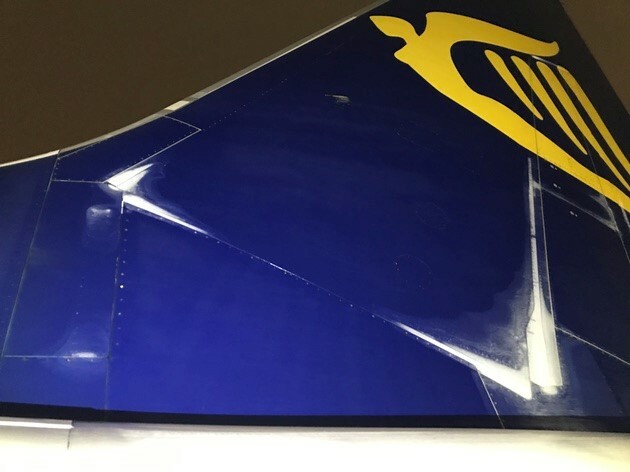 The vertical stabilizer is also known as the fin. The horizontal faring in front of the fin is known as the Dorsal Fin; it is empty and has no function other than streamlining. The HF antenna is mounted in the leading edge of the fin, the open access panel at the base of the leading edge is where the HF antenna coupler is mounted. The flightdeck windows are made of layers of glass and vinyl. The outer pane is a rigid hard scratch resistant surface. The inner pane is structural and carries the aircraft pressure load. The Vinyl layer prevents a broken window from shattering. Windows 1, 2, 3 & 4 have a conductive layer between the outer pane and the vinyl layer this both de-ices the windscreen and makes the windows less brittle. Windows 1 & 2 were re-designed in 2009 to include an inboard plastic antispall liner to prevent broken glass from entering the flight deck during a bird-strike. 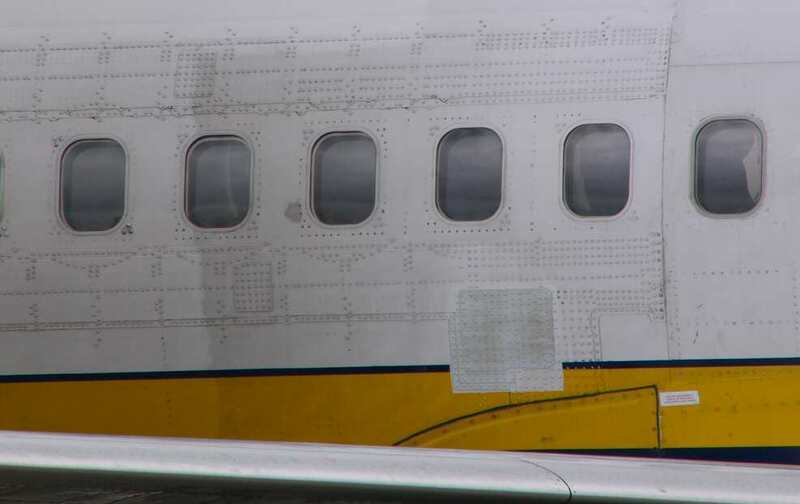 On the 3rd Feb 2005, 737-700, N201LV, L/N 1650, was the first ever 737 to fly without eyebrow windows (window numbers 4 & 5). They have been standard in Boeing aircraft back as far as WW2 bombers to give better crew visibility. Now they have been declared obsolete and removed from production. The design change reduces airplane weight by 20 pounds and eliminates approximately 300 hours of periodic inspections per airplane. Retrofit kits to remove existing eyebrow windows are available.